Now, darling, that's a hedge! 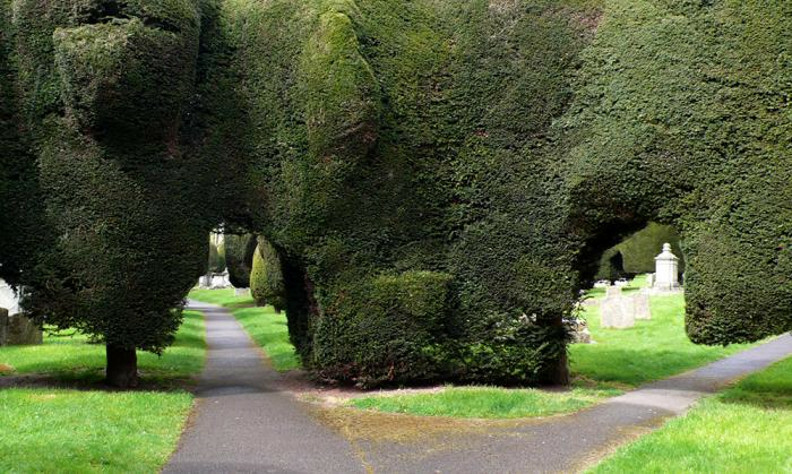 I find yews overused but for good reason. They can really take hard pruning and/or regular clipping but are so slow growing. Cultivars of Taxus x media like "Densiformis", "Wardii", "Hicksii" and "Hillii" are commonly found in our garden centres, nurseries and, therefore, local gardens. Inevitably, they are shaped into variations of meatballs growing 2 feet away from the front of the house. All this in the name of "foundation planting"! If shrub lollipops, popsicles and gigantic potatoids interest you, here's inspiration! I admit this would look fabulous right now with the snow we're having in Toronto. Your labour costs would likely go through the roof but so would the "wow" factor for an appreciative audience of this sort of look. 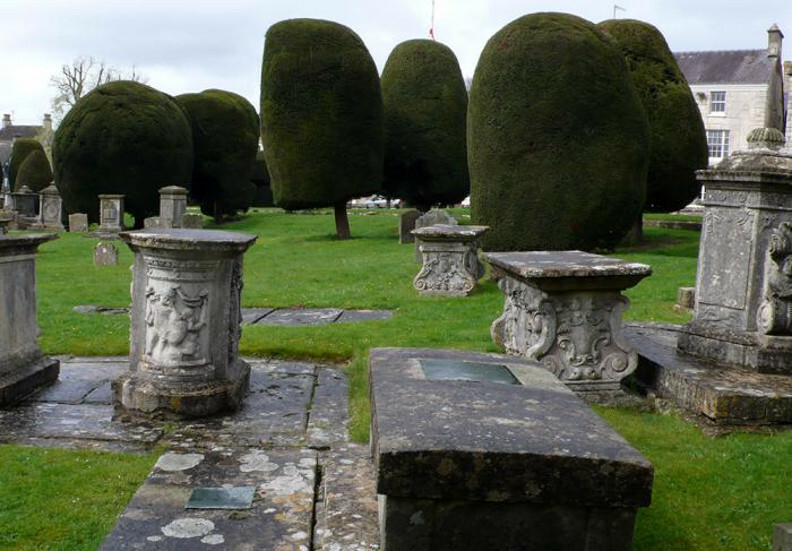 The other thing about yews ( especially those found in graveyards) is their longevity. I wonder where one could find the oldest in Toronto? I think you answered your own question! My best guess would be in one of Toronto's older cemeteries like Mount Pleasant or St. James/Toronto Necropolis. Yews left to be grown as trees have nice bark and good form. I love yew, too, Paul. And the new growth can be quite attractive in some cultivars. We need to share the love, Helen! Unfortunately, the love for Emerald cedars seems to be stronger in the GTA, sigh. In an area where we have limited evergreen material to work with , Yews are very uselful, much nicer that most of the cedar varieties available here. They are however very expensive here and so less used. Normally seen as specimen plantings. I personally love their deep green color and red fall berries. Hi Paul, I've got me a 'Hicksii' in my garden. I bought it (out of curiosity more than anything) as a little guy about 10 years ago and it's about 6 feet tall now. With the wet winters and dry summers we have here in the Pacific Northwest, you'd think mine would struggle but it's just as happy with mud or dust. Definitely not over- "yewsed" if you ask me. your "little guy", as you can attest to, isn't so little anymore! I'm a little surprised about "Hicksii" doing that well with the wet winters as I've read that Taxus need excellent drainage over winter. I like your pun, lol! I am a bad, bad gardener. I actually CUT DOWN two old yews which stood shoulder-to-shoulder smack-dab in the middle of our property and effectively shielded our house from the lovely view to the south. I wept. I had a sacrificial burning. I knelt on the good dark earth and begged forgiveness. But it had to be done, and now I have great plans for the bottom half of the yard which has been hidden from me.